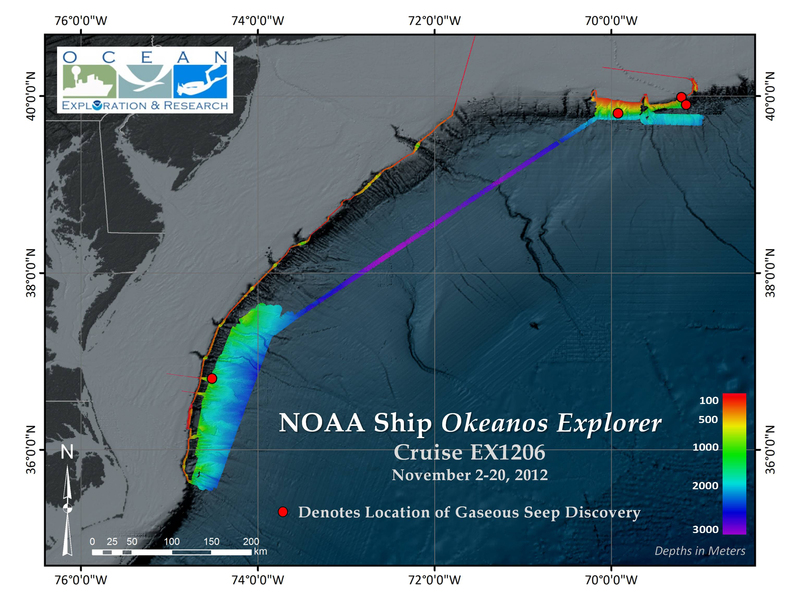 Map showing bathymetric data collected on the Okeanos Explorer cruise EX1206, from November 2 - 20, 2012. The locations of seafloor gaseous seep discoveries are indicated with a red circle. Image courtesy of NOAA Office of Ocean Exploration and Research. Download image (jpg, 1.4 MB). Between November 2 and November 20, 2012, NOAA Ship Okeanos Explorer conducted an expedition (EX1206) in the North Atlantic Ocean focused on systematically mapping the continental slope off of the U.S. East Coast. During this expedition, Okeanos Explorer traveled 5,231.3 kilometers and bathymetrically mapped 15,466.5 square kilometers of the seafloor. In addition to bathymetric data, water column acoustic backscatter data and sub-bottom profiles were collected with onboard sonar systems. The areas surveyed during the expedition supplement existing seafloor mapping data collected on four previous Okeanos Explorer expeditions in the region as part of NOAA’s Atlantic Canyons Undersea Mapping Expeditions (ACUMEN) project. 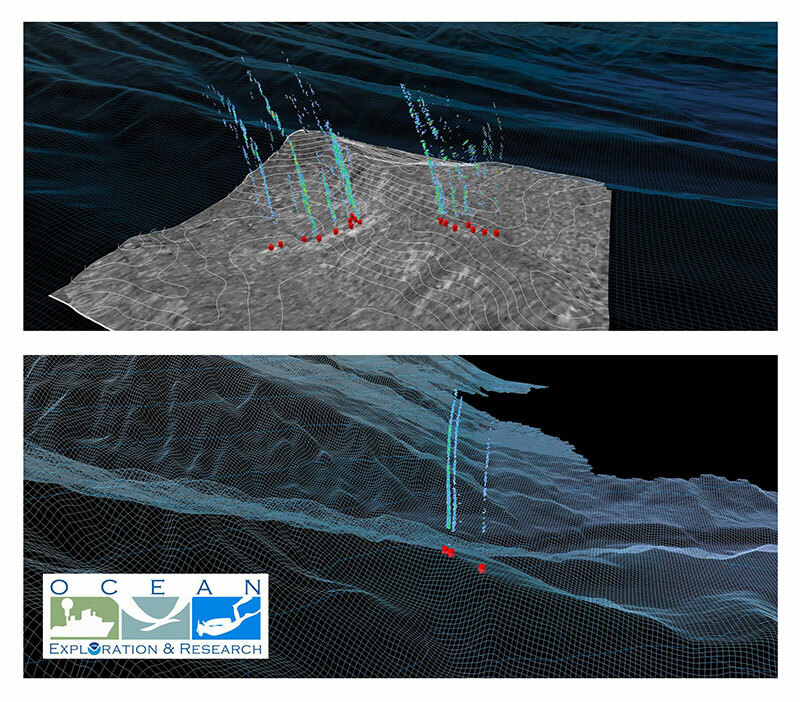 Perspective image of gaseous seeps at locations 1 and 2 derived from water column acoustic reflectivity observations. Also shown is associated bathymetry and seafloor backscatter (location 1-top). Image courtesy of NOAA Office of Ocean Exploration and Research. Download image (jpg, 2.7 MB). During the expedition, in the course of systematically mapping the seafloor, the Okeanos Explorer multibeam sonar recorded acoustic backscatter targets in the water column at four locations. The water column targets were consistent in appearance and scale with confirmed gas plumes imaged by Okeanos Explorer in the Gulf of Mexico and at the Blake Ridge as well as Cape Fear Diapirs. A review of available scientific literature indicates that gaseous seafloor seeps were not previously known to exist at these locations. Based on preliminary information, scientists believe the gaseous seeps are likely methane. Approximately 147 kilometers east of Cape Henry, VA. Approximately 163 kilometers south of Nantucket Island, MA. Approximately 158 kilometers southeast of Nantucket Island, MA. Approximately 160 kilometers southeast of Nantucket Island, MA. The NOAA Office of Ocean Exploration and Research (OER) is presently working with partner scientists at the U.S. Geological Survey and the U.S. Bureau of Ocean Energy Management to fully understand the implications of these discoveries for the scientific and resource management communities. All data from Okeanos Explorer cruise EX1206 were post-processed and publicly released by the National Geophysical Data Center on December 20, 2012, 30 days after the conclusion of the cruise. The data can be accessed via the Digital Atlas.